2 Corinthians 5:17 is my very favorite verse in all of the New Testament! It is such a promise of our new identity in Christ - particularly poignant for those in recovery. 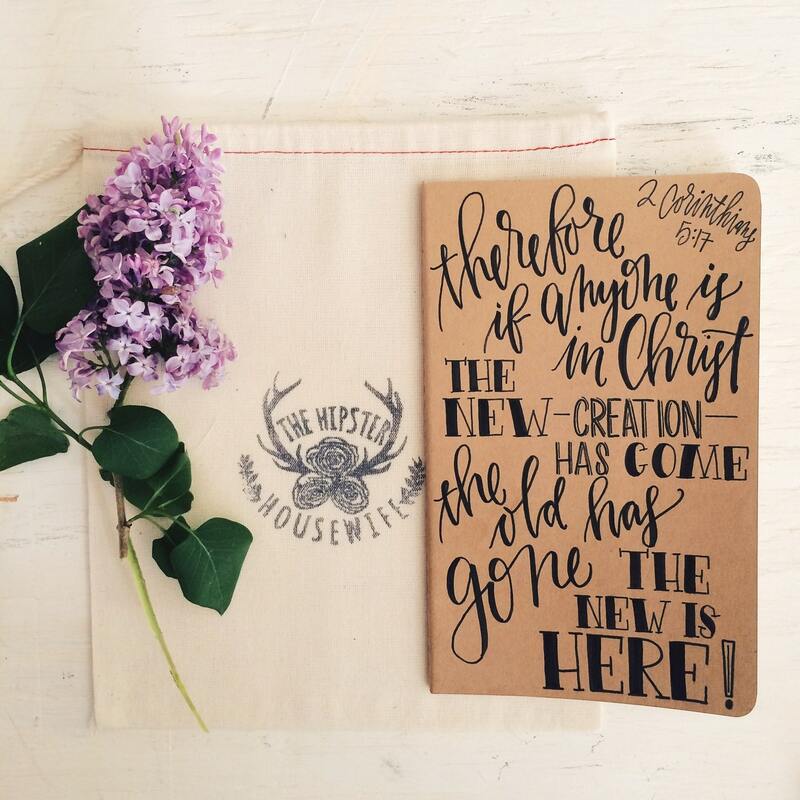 Hand lettered in archival inks on a top of the line Moleskine notebook, this little book makes the perfect prayer journal or place to jot those sermon notes down! Each one is lovingly created by hand in my signature script, making them completely one of a kind and unique to each owner. The notebook itself is a Moleskine journal, extremely high quality and beloved of artists and writers the world around. The finished product is truly a treasure and would make a fabulous present! 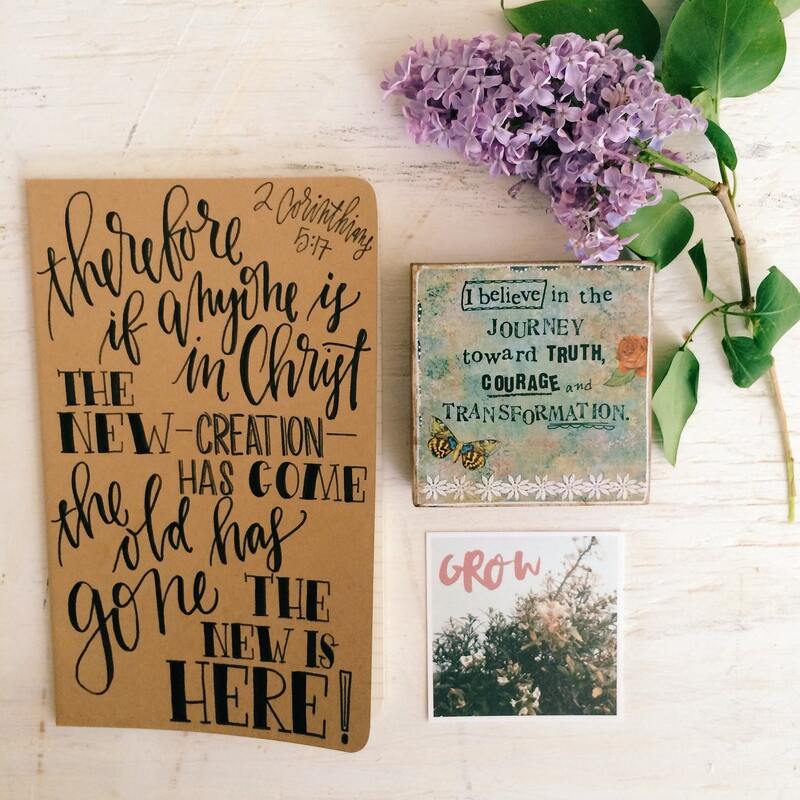 Each journal also includes a scripture memorization card and journal prompts to help get you started - perfect for the novice and life long Christian as well. I take the time to pray over each and every one of these as I create them, and it is truly a spirit led process for me. It is my greatest hope that it will aid you in your walk with Christ! 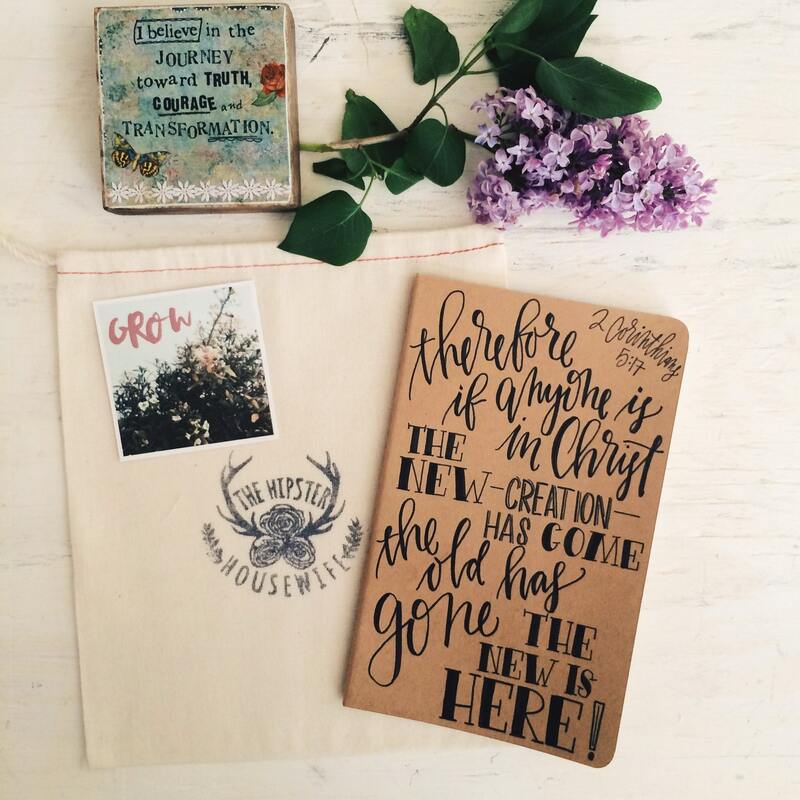 For no extra charge I will personalize the inside cover of one journal with a name or message of your choosing! Just leave what you would like written in the 'message to seller' box at checkout and consider it done! Extensive personalization such as an additional piece of scripture or message longer than a sentence will incur additional charges. Message me before purchase if you are unsure. Like the idea but looking for a different verse? Simply purchase my custom journal listing! Custom journals start at an additional $5. Comes lovingly packaged and ready for gift giving! I accept payment through Paypal and with credit cards directly through Etsy. Payment is due at the time of purchase. Checks and money orders are not acceptable forms of payment at this time. Thank you for your understanding! *IMPORTANT* please make sure you have the correct address listed with your etsy name. I ship to the address listed, and can not be held responsible for lost packages due to incorrect information. Shipping both domestically and internationally is via the USPS, with the exception of certain large items that are shipped domestically via FedEx. Any and all international custom fees or dues are the responsibility of the buyer. All items are packaged carefully (and always with an extra goodie or two!) with as much love as the items themselves! Tracking information is always included, but please remember I have as much control over the USPS and their tracking system as you do! Individual processing and shipping times are noted in each individual listing. If you need an item by a specific date, please be sure to contact me BEFORE purchase. All "ship by" dates are estimates and if the timeline changes you will be notified. When you receive the shipping notification email that means we have printed your label in the The Hipster Housewife studio - the first of many steps to get it out the door! From the time we print your label to the time USPS or UPS posts the first tracking data, your order is in a weird grey area where the computers can't say precisely where on the journey it is. If we were a bigger, fancier company, we would probably call it "processing time." The weird grey area is not weird or grey, it's our happy office. We are dancing and singing and putting stickers on your packages. We just love you guys so much! Once the order is on its way, the tracking updates. This can take up to 3 business days. If there are extenuating circumstances you will be notified ASAP. Thank you so much for your patience as we fill your orders, big and small, with great love. We are so thankful for your role in this ministry! To prevent any buyers remorse, please contact me prior to purchase to ask if you have any questions. I would be happy to send you additional images if you're unsure of color, size, quality, paper type, etc. Due to the unique handmade nature of my wares I try to be very clear in each listing as to the details of each item, and in order to best serve our customers refunds and exchanges are offered on a case by case basis. All return shipping and costs incurred are the responsibility of the buyer. Refunds are processed once the item has been returned to our studio in the same condition it was shipped. I accept cancellations on orders within 24 hours of purchasing. Depending on the nature of the item a small restocking fee will be assessed. If an item is promised by a certain date, and does not arrive by that date due to an error at the post office I can not be held liable. Shipping is out of my hands as soon as I bring it to the post office. I provide tracking on all of my items for that reason. HOWEVER please contact me if you are unhappy, before leaving a review, and I will do my very best to resolve any issues you have. Customer service is of the utmost importance to me, and if you're not happy, I'm not happy!! When ordering custom items, please include the EXACT wording and spelling you would like on your piece. I can not be held responsible for any mistakes due to incorrect information. All items in my shop are original works -my photos, text, and products belong to me and are my copyrighted intellectual property. Please remember that I am one woman doing my very best to answer God's call on my life! I know that tensions can run high especially when purchasing gifts for our loved ones, but your grace and patience is appreciated more than you know! If you are a Massachusetts native such as myself sales tax will automatically be added onto your total. I offer wholesale on a limited basis, please contact me directly for more information. Prayer Journals are not available at wholesale pricing. I offer gift wrapping and direct mailing to the recipient of the gift. Please contact me before purchase to set it up. I do offer rush options when there is a time crunch and you need an order by a specific date. The fee is on a sliding scale ranging from $25-55 depending on how soon you need it and includes priority shipping. Please contact me before purchasing if you need you item before the estimated timeframe.